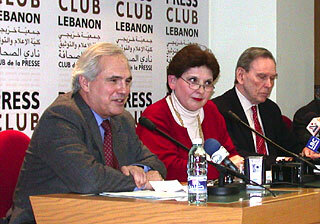 A senior U.S. administration official and a former ranking diplomat urged a packed hall at Beirut’s Press Club to consider the common ground between Arabs/Muslims and Americans, rather than just dwell on differences in the post-9/11 environment with Washington’s war on terrorism and possible conflict with Iraq. Ambassador Christopher Ross, senior adviser to the Undersecretary of State for Public Diplomacy/Public Affairs and special coordinator for public diplomacy, and, Ambassador Richard Murphy, former assistant secretary of state for Near Eastern and South Asian Affairs and currently a senior fellow at the Council on Foreign Relations were the featured guests January 10, 2003. They fielded questions about America's intentions in the Middle East and explained Washington's policies to Lebanese members of parliament, journalists and academicians. “Some people point to a clash of civilizations,” said Ross, adding that they forget the fundamental shared values in the United States and Arab-Muslim world of family, respect for religion and importance of education. The open discussion dubbed “The U.S. Image in the Arab World,” was organized by the U.S. embassy in Lebanon, and chaired by the Institute for Professional Journalists’ director at LAU, Magda Abu-Fadil. Murphy, for his part, admitted to past U.S. shortcomings but insisted on putting a positive spin on where American-Arab ties were heading, given the chance. 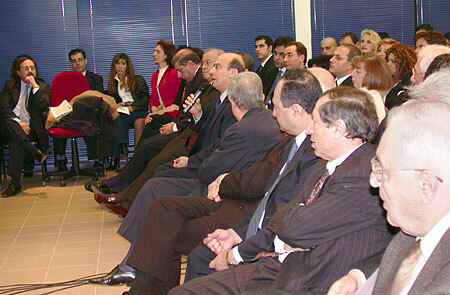 MP and LAU Board member Nazem El Khoury participated in the lively debate.